I promised a Passover post for the first night of Passover, so here it is. You are not permitted to eat leavened bread, or foods with flour on Passover, (it's sort of a gluten free holiday! ), so desserts can be challenging. Coconut macaroons are a Passover tradition, as well as bad, tasteless kosher for Passover cakes. I usually skip dessert tonight. These little treats were excellent. They come from Dan Lepard's fabulous baking site. Lepard is the UK's answer to Martha Stewart. Not sure if Mr. Lepard will like that comparison, but what can I say. His recipes are wonderful, however, that metric conversion thing stumps me every time. And please don't tell me to go to google and put in the UK metric conversion to U.S. equivalent cups, it doesn't always work out. Flour, sugar, and nuts have totally different ratios (volume vs. weight) and did you know that they use "caster" sugar over in Great Britain to confuse me even more? Caster sugar, I found out, is NOT confectioner's 10x powdered sugar as many people may think, but is the standard baking sugar of G.B., a finer granulated sugar. Stop stumping me. I ground my sugar (as the helpful baking bloggers advised) in a coffee grinder, to get a nicer, finer grind. It worked out nicely. And what the heck is "stem ginger"? I come to find out that it's very popular over there and is candied ginger in little jars with syrup. I found it at the Asian market. See, I told you Passover baking is a challenge. Ok, now that we have the proper sugar, the proper ginger, and the right weather (shouldn't be raining when you bake macaroons, or they will flop), we can begin. Mix the ground almonds, sugar, egg whites and ginger until evenly combined. 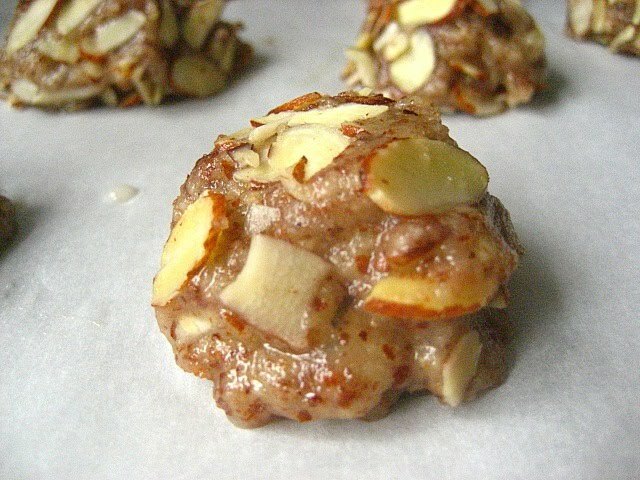 Roll into tablespoon size balls, then press on to a mound of flaked almonds so a layer sticks to the outside. The dough is very sticky, so do this w/ wet hands. Place the macaroons on a tray lined with nonstick paper, then heat the oven to "170C (150C fan-assisted)/335F/gas mark 3" (Just preheat the oven to 325F!) and bake for 23-25 minutes, until golden brown, turning the tray halfway through the baking time to make sure the heat gets to the macaroons evenly. 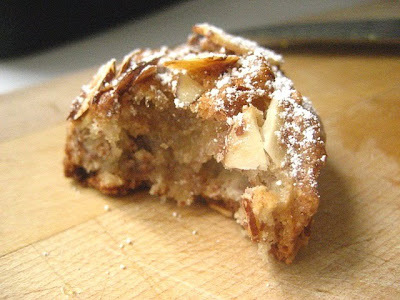 Remove from the oven, and dust w/ confectioner's sugar while still warm. Leave on rack to cool. These are spicy and sweet with a soft center and crunchy exterior. 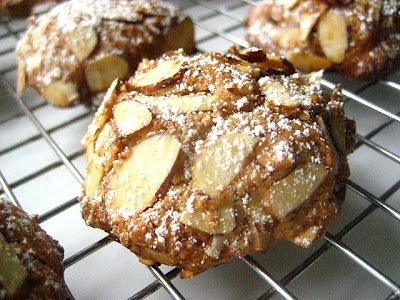 If you want to make traditional coconut macaroons, click here for the easy recipe. I made 2 different flavors this year. The correct spelling should be "castor" sugar, it is aldo used in Australia for all baking purposes it is just a finer version of the standard granulated sugar used in the USA. Target used to sell castor sugar under the label of "bakers sugar" - alas no more. Making pavlova with castor sugar is a dream , making pavlova with granulated sugar - is challenging. I usually put some suger in a food processor with the sharp blade and with a few pulses it comes to the correct consistency. This will not work with in a blender . Once you have used castor sugar for baking , it can be challenging to have to use granulated sugar as it is so much coarser and really makes a difference in the preparation . The macarrons sound yummy and I love anything with ginger in it . If you look up the spelling, it can be either or (castor/caster). It worked well with grinding the sugar up in my mini grinder, and it worked out beautifully. The macaroons came out perfectly. Stacey, thanks for both recipes--this one and the easy one. I'm also metrically challenged. I do a lot of baking and tend to weigh my ingredients. Unfortunately, it's rare to find recipes in weights. You deserve a medal for your efforts in making this recipe. All the converting, decifering, etc. but the best part is your sense of humor. Nothing like a big smile first thing in the morning. These look really good! I think I might invest in a scale for all of those metric recipes that I never make! I love the ginger in these cookies! Very nice! Hi Stacy , thanks for the comment and you are correct ..... another way I deal with all my metric recipes is to have a scale which has both metric and imperial , weigh the ingredients in metric first , then hit the imperial button - you get some strange sounding numbers - but that is another way to get around it . Because as you noted , metric to imperial weight in both dry and wet ingredients can affect baking. These macaroons look so delicious. Sounds challenging but worth it! These macaroons look different and delicious. A nice change for Passover. Passover cake is REALLY good if you bake it yourself. My mother in law bakes the most amazing cakes on Passover. Fabulous nut cake, an apple cake etc. I think the tasteless ones are the commercially bought ..
You know I'm not a big fan of ginger in sweets, but I'd make an exception for these. Hi Stace - they look fabulous! My cousin made rose-flavored macarons this year, loved them with Cabernet.